The Dogs finish with two wins by a combined score of 13-2, running their winning streak to four in a row. Now, a movie (or four) on an overnight bus trip home. The Dogs are back at it tonight after a travel and practice day yesterday as they conclude their two-game road trip when they visit the Prince George Spruce Kings at the Coliseum. After a 7-1 win in Langley on Thursday night the team bussed up North yesterday, with a stop at 100 Mile House for a practice before finishing the journey up to PG. We arrived just after 7:00pm, getting checked into our hotel in just enough time to get over to the Coliseum with Head Coach Paul Esdale and Trainer Dave Campbell to catch the Vernon Vipers visiting the Spruce Kings, a 3-2 Prince George win. Catch all the action tonight on Boston Pizza Bulldogs Hockey Broadcasts on 93.3 The Peak FM with the pregame show starting at 6:45 and the puck drop to follow at 7:00. Here's a cool video with a view of the Prince George Coliseum, taken back in the 2009 season - the Dogs are lucky that we are here in October and it's still relatively balmy up here as the last couple of years it has been in the DEAD of winter! Gotta love Hockey Grandma! That's it for now! ...For a weekend on a bus with smelly hockey players! ...so do I! Homework, studying, if you will! 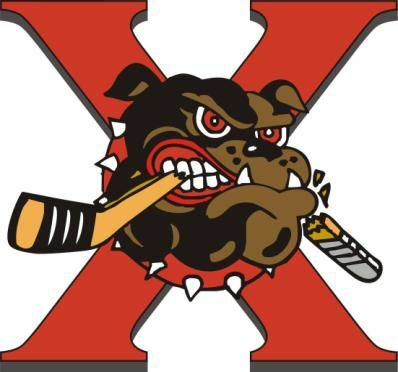 Saturday October 15th the Dogs lost 7-1 in Langley to push their winless slide to six. What a difference 11 days can make as tonight they returned the favour with a 7-1 win of their own, their third win in a row to now sit in 4th place in the Coastal Conference. The Dogs started the game well with an edge in shots and a great shift by the Dorais-Berkholtz Tironese line resulting in a penalty to Langley. However it was the Rivermen who scored shorthanded on a breakaway to go up 1-0 with Tyler Hanzlik scoring. The Dogs answered when Tryg Strand found his own rebound off a Yan Kalashnikov set up to make it 1-1, the second for Strand this season with both coming in Langley. The Rivermen would have another breakaway to take the lead later in the frame but Matt Larose made the save to keep the game tied. 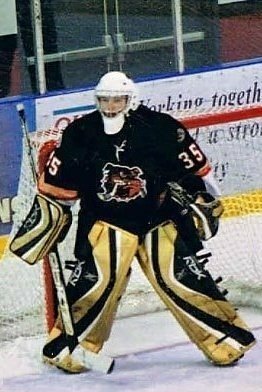 Larose would come up huge again early in the second with the Rivermen on a 5 on 3 powerplay for 1:37 in duration as he made 5 or 6 great saves to hold the fort. The Dogs took the lead when Daniel Delbianco - two points in two games for him since joining the team - fed the puck behind the net for Evan Tironese who set up Yan Kalashnikov in the slot where he buried a one-timer. It would be Yan again scoring to make it 3-1 on a 2 on 1 rush set up by affiliate player Mitch Crisanti as he went low blocker side. Yan completed the natural hat trick late in the period with Crisanti setting him up again, this time on a pass from behind the net that Kalashnikov roofed high-short side on Jim Kreuger. Lars Hepso made it 5-1 going low blocker on a breakaway during a four-aside situation in the third before the Dogs added two late ones with Langley appearing to lose their composure. First it was Justin Morello potting an end-board bounce on a Josh Mitchell shot to make it 6-1 before Mitchell scored his first of the season on the power play after the Rivermen took a penalty before the puck was even dropped after the Morello goal to make it 7-1 for the eventual final score, with assists going to Morello and Nowakowski. Josh Mitchell was especially impressive when you consider that he woke up today in Rochester, NY, after visiting R.I.T on a flydown before flying back to the West Coast in time for the game tonight. Mitch Crisanti of the BC Major Midget's Vancouver NorthWest Giants also had a great game, coming up with two assists and 3rd star honours while looking like a BCHL regular, not a kid playing his first game in the league. 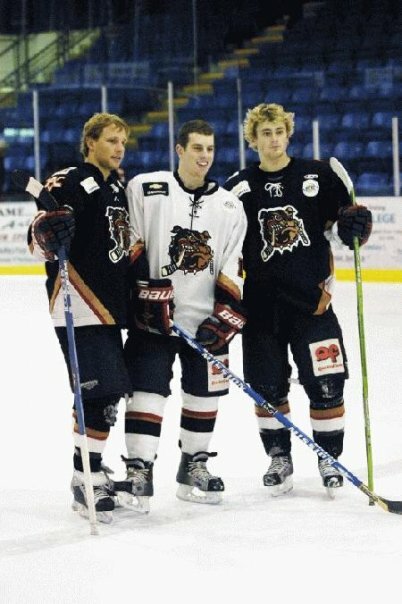 Here's hoping we will see him in a Dogs jersey again sometime soon. Now to enjoy this post game meal and a bus ride to Kamloops! "Chilly Willy" as I call him. "Will the thrill" as some of the other guys call him. He's the man that gets us from Point A to Point B. Point A, I guess - the Langley Event Centre. Or as much as I can get of it in one picture as it is quite the monstrous facility. The Dogs visit the Rivermen tonight before bussing up to Prince George - Point B, for Saturday's game against the Spruce Kings. Or point P or something like that if you count all the spots in between I guess! Then we will turn around and head back to the Alberni Valley....Seems like a lot of hours on the road for just one game doesn't it? Too bad the TimberWolves and Millionaires don't call Williams Lake and Quesnel home anymore because it sure made sense to make a weekend and three games out of heading up North. Catch the pregame show on Boston Pizza Bulldogs Hockey tonight from Langley at 6:45 with the play-by-play to follow at 7:00pm. Off to catch the bus! More later. 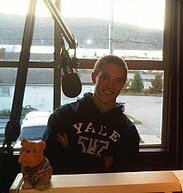 By request - here's Marlon Sabo's 1st Intermission interview from Sunday afternoon against Powell River. This is a great example of why I do these interviews. Not just for current events, wins and losses, future goals, etc. I do them so I can get to know the guys better and the listeners can get to know the guys better as well. 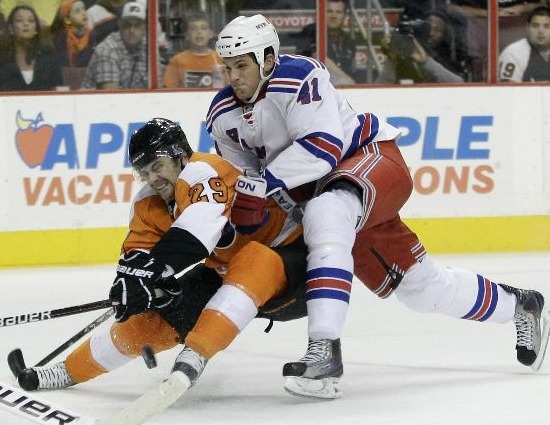 As humans, as people, instead of just a name and a number wearing skates and holding a stick. If you click on Marlon Sabo's profile, you'll see his hometown as Surrey. If you interview him like I did, you find you his REAL hometown is Lippstadt, Germany - even Marlon took a moment to remember it and his geography might be off, haha! Hey, he was six, we'll cut him some slack - Cool stuff! And one more tidbit today as I continue preparations for the departure for the road tomorrow - this one came up on my show this morning, some vintage Gretzky. No matter how much the game changes ladies and gentlemen, boys and girls, if you move the puck like this you will have success! And what a reception from the fans in Winnipeg for Wayne. Harry Zolnierczyk interview, by popular demand...FIXED! I can't count how many people have asked me to hear this one again...originally on my 93.3 The Peak FM Morning show on Tuesday, here's Harry Zolnierczyk talking about his first NHL game, and his first NHL goal. 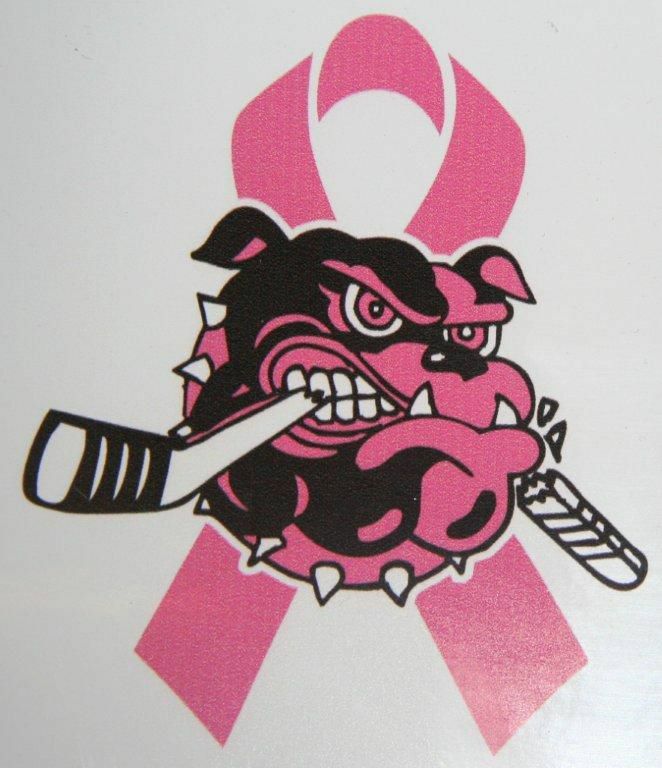 ...All in support of the fight against Breast Cancer - well done sponsors, well done Dogs, well done fans! And VIDEO HIGHLIGHTS! Outstanding job by Adam Hayduk to throw this together so quickly. 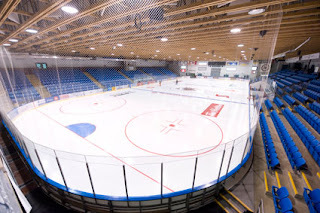 The Dogs are back on home ice today as they host the Powell River Kings for the first time this season. 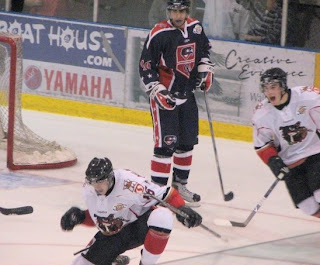 These teams last met October 7th in Powell River, a 4-1 Kings win. With the win the Kings ran their record to 6 and 0 on the season, and 5 and 0 on home ice. When they arrive at the Dog Pound today they will be playing their final game of a seven-game road trip, with a record of 7-4-1-0. 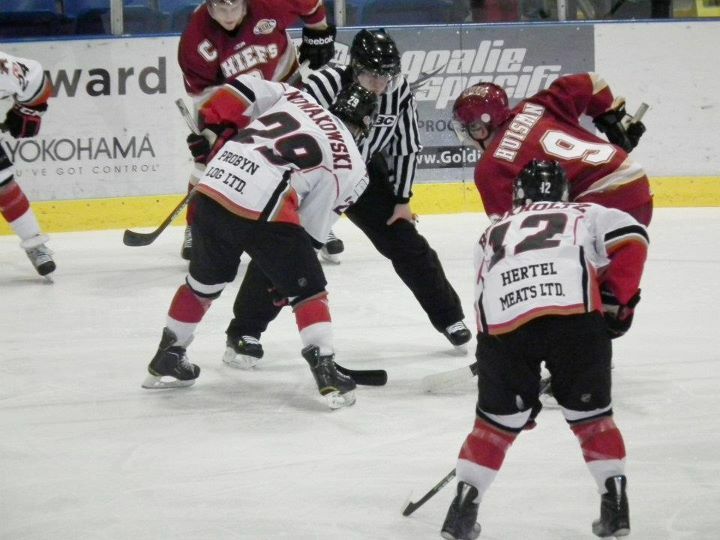 It has been tough for the Kings, as playing on the road always is (even though the Kings have made a habit the last couple of years of making it look easy) as they have a record of 1-4-1-0 over the six games, including a 1-0 loss in Langley last night to the Rivermen where they out shot their opponents 37-14. Catch the pregame show on Boston Pizza Bulldogs Hockey on 93.3 The Peak FM at 2:15 with the puck drop and play-by-play to follow with Ace and myself at 2:30. 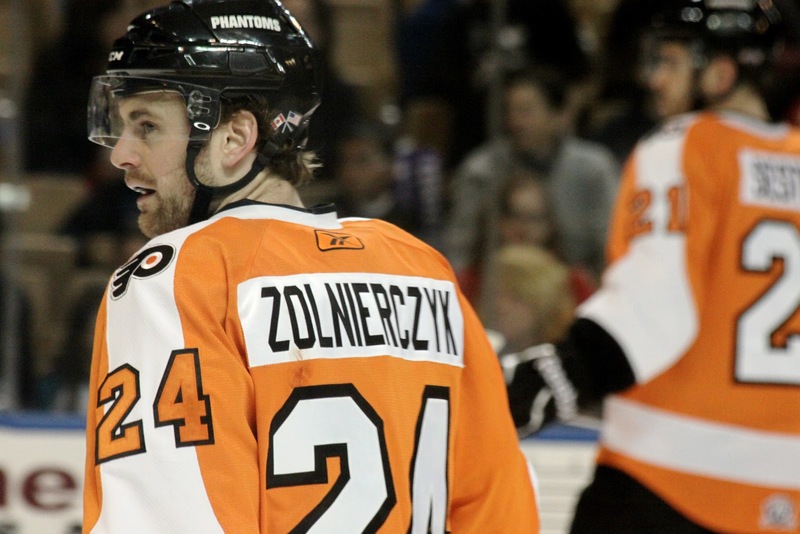 Former Bulldog, recent Flyer, and current Phantom Harry Zolnierczyk will be my 2nd Intermission guest, an interview that I have had countless requests for since it originally ran earlier this week on THE PEAK after Harry scored his 1st NHL goal in his NHL debut. It's the final Home Game of October, which means the team will be giving fans the "jerseys off their backs" at the end of the game today. 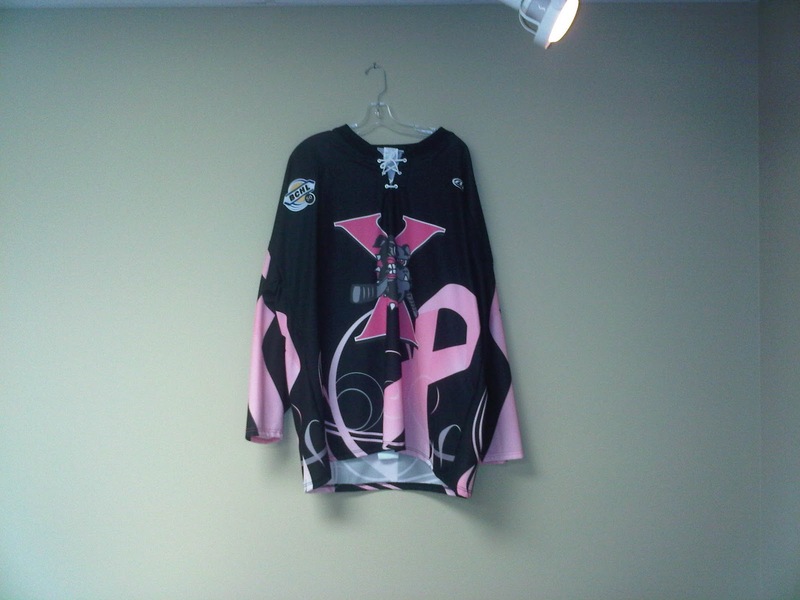 More specifically, their pink jerseys that they have worn all month at home (except against Chilliwack on Friday, some wires must have gotten crossed there) in support of their fight against Breast Cancer and in their efforts to raise awareness and funds for the cause. The jerseys have been on display at the sponsor businesses for the better part of the month (that's Chase Van Allen's at 93.3 The Peak FM in the picture above) where fans have been making donations in turn for getting entry forms to win the jerseys today. Do not forget, you must be present at the end of the game today to win! If your name is called and you don't make your way down to the ice to get your jersey presented to you by the player, they will call another name! Last but not least, thanks to all the fans that came out for the Guns N' Hoses Battle of the Badges Charity Hockey game last night with the Port Alberni Fire Department taking on the Port Alberni RCMP. There was well over 350 fans in attendance - well more than their expectations. The people from the Port Alberni Association for Community Living were blown away with the support of the hockey fans here in town, reaching all their goals for last night. Way to go! Also a huge thanks to the Policemen and Firemen for their efforts in lacin' em up for the game and to Ron Paulson for being such an unbiased and professional referee....and the firemen for finding a couple of ringers for the third period! 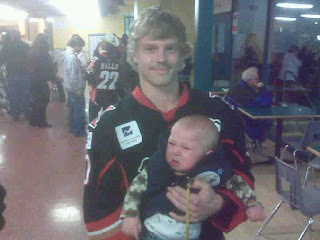 Lars Hepso, maybe stay focused on hockey for now, HAHA! The AVB snapped their winless-in-six slide with a 3-2 come-from-behind win over the Chilliwack Chiefs Friday night at the Dog Pound. You live and die with your special teams and they were huge in the outcome tonight with the Dogs scoring their first power play goal since three games ago, October 8th in a 5-5 tie in Duncan. Wouldn't you know, tonight it turned out to be the GWG, game winning goal. The Dogs killed off 100% of the penalties they took, a feat they hadn't accomplished since the last time they won a game, October 1st in Duncan. And, wouldn't you know it, tonight they would be tested until the final buzzer with CHILLIWACK (that's another 2 bits in the jar) going to the man advantage with 1:50 left on the clock trailing by a goal. You live and die by your goaltending too - Max Fenkell was great tonight. 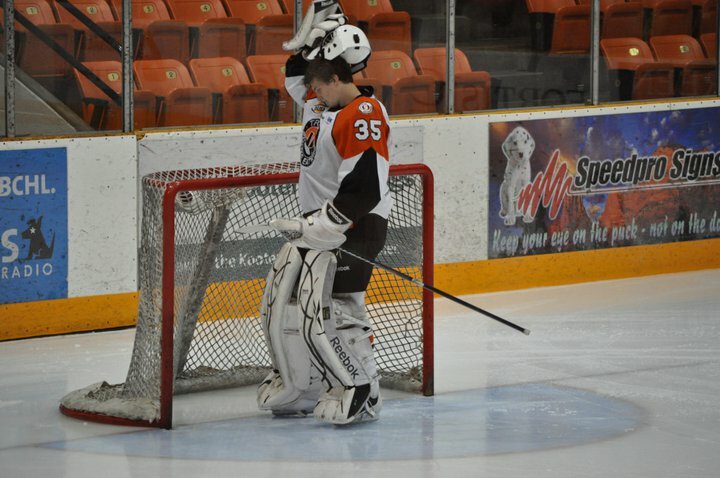 While not as busy as Mitch Gillam for the Chiefs, he came up with the big saves when needed. I felt for Gillam who had a great night turning away 50 of 53 shots, only to have two unlucky bounces from sharp angles beat him. And you can't forget the oh so elusive "puck luck", the bounces, the breaks, etc - the Dogs scored those two goals, the Chiefs hit a post late in the game, the Dogs got a 5 on 3 power play, etc. It was nice to get back into the "friendly confines" of the Dog Pound. It was nice to see the team play at home. They are a different club, energized by the crowd. They always push the pace and more often than not have the extra work ethic and determination that can decide the outcome. Home Ice doesn't win you games alone but it certainly helps, and certainly helps the Home side in the Dog Pound especially. Even Harvey Smyl said on the pregame show that this was one of the hardest rinks in the league to play in, no matter whether the Dogs are having a good season, a bad season, its early or late in the year, he says it's always tough. The same can be said about a Smyl coached team as they will always be a good team that will give you a tough game with a group of players that have bought into playing a good "team" game. It is too bad that Chilliwack is in the Interior Conference this year, and that the schedule isn't a full interlock as these teams won't meet again unless its in the League Final. I always enjoy catching up with Harvey Smyl and having the chance to interview him. In the end it was my "vet" status that was my downfall, as I got up to $1.25 on the "swear jar" for saying Langley instead of Chilliwack. Old habits are hard to break. I think I only said "Chiefs" twice on Saturday night in Langley, I was pretty proud of that! Don't forget the Guns N' Hoses "Battle of the Badges" Charity Classic tomorrow with the PA RCMP taking on the PAFD to support the Port Alberni Association for Community Living. Puck drop is 7:30, admission is by donation! It seems like forever ago that the Dogs played on home ice - even though it was only a couple weeks, 17 days and four games, it seems like an eternity. The team will look quite different than the one that left the Dog pound with an above .500 record of 3-2-0-0 as they carry a record of 3-5-1-0 and a six game winless slide into action tonight. It's the first meeting since 2005-2006 between the Dogs and Chilliwack Chiefs - the LAST GAME of 2005-2006 in fact, when the Dogs fell in Chilliwack to fall a point short of the BCHL Regular Season title. Just thinking about it brings back bad memories - the Dogs needed just two points in their last three games to clinch the Chevrolet Cup - they went 0-2-0-1 over that stretch, scoring the game winning goal on their own net against Nanaimo and Chilliwack and losing in OT in Langley between those games, coming as close as having a Jordan Kremyr penalty shot in OT go off both posts, the back of the goalie, and STILL not go in. Enough of that - ancient history! Walker Hyland will make his Dog Pound debut tonight on the back end. He was an impressive addition a couple of weeks back with two goals and two assists in two games - not bad for a D-man playing his first two games with a new team - before having to head home due to family issues. Welcome back Walker! And a welcome back to Brandon Adams, expected to play tonight after rejoining the team from the NAHL. Adams has great speed, a great shot, and can score. Adams is my guest during the 1st Intermission show tonight so don't miss it! It was nice to see Brandon at the rink this morning sporting a mile-wide smile. He is excited to be back, and said some great things about the community and the fans here and how it was the first thing he thought of when he knew he was coming back. The Dogs will have Port Alberni's Keenan McConnell in the line up as an AP tonight on the back end. 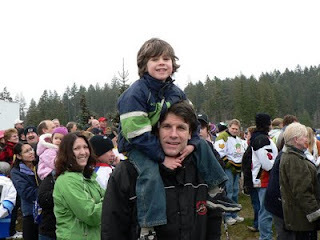 He is into his second season with the Oceanside Generals of the VIJHL. I'm not sure if we'll see Matt LaRose between the pipes tonight or Daniel Delbianco on the back end, but we will most likely see them play by Sunday. Catch the pregame show on Boston Pizza Bulldogs Hockey on 93.3 The Peak FM at 6:45 with the puck drop to follow at 7:00pm. And don't forget to WEAR PINK. 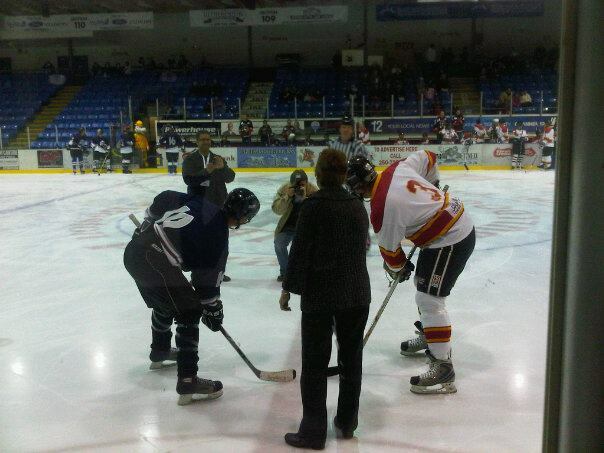 Tonight's 2nd Intermission feature guests are Dominic Rockall and former MLA Gerard Janssen from the Port Alberni Association for Community Living, an interview from my Peak Morning Show earlier this week promoting tomorrow's Guns N' Hoses Battle of the Badges charity hockey game between the PA RCMP and the PA Fire Department. FREE ADMISSION for a great cause, 7:30 tomorrow at the Mulitplex, I'll be your P.A guy, so hopefully I'll see you there! 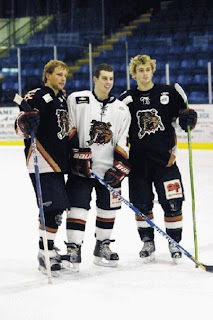 The Alberni Valley Bulldogs would like to announce that they have acquired the playing rights of 92 G Matt Larose, 94 D Daniel Delbianco and 93 D Eric Walker from the Trail Smoke Eaters in exchange for 92 D Tanner Hicks, 93 D Marley Keca and 92 F Taylor House. Larose originally from Nanaimo, played his Midget hockey in Port Alberni. 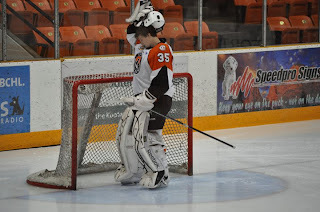 Larose played 15 games last year with Trail and had a 2.67 GAA and .923 save percentage. Delbianco played for the Vancouver NorthEast Chiefs in the BC Major Midget League last season scoring 9 goals, 20 assists for 29 points. This season he has played 7 games for Trail. 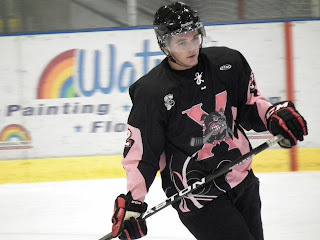 Walker posted 4 goals and 7 assists and 60 penalty minutes last season with Trail. Walker is presently attending the University of Northern Michigan. The Bulldogs would like to thank Tanner Hicks, Marley Keca and Taylor House for their contribution to the organization and the community of Port Alberni. 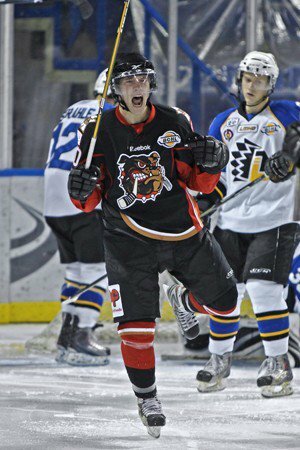 The Alberni Valley Bulldogs would like to announce that 92 F Brandon Adams returns to the Bulldogs from the Corpus Christi IceRays of the NAHL. The Prospect Heights, Illnois native, posted 1 goal, 2 assists in 6 games with the IceRays. Adams was a significant contributor last season scoring 12 goals and 13 assists for 25 points in 52 games with the Bulldogs. “The return of Brandon is great news,“ comments Head Coach/Assistant Director of Hockey Operations Paul Esdale. “Brandon is a outstanding young man and will fit nicely into our forward group,”states Esdale. The Bulldogs have traded 93 D Zach Todd to the Brockville Braves of the CCHL for future considerations. In other player moves the Bulldogs have released 92 G Adam Harris. For more information please contact Assistant Coach Adam Hayduk at 250.723.4412.